The Methodist School of Music (MSM) presents Worship Works, focusing on techniques and approaches to creative excellence in the genres of contemporary worship music. Each instrumental strand uses workshops to impart knowledge and skills, as well as to foster productive interaction and fellowship between musicians. In addition to the practical skills gained in the individual workshops, the highlight of the course is a grand get-together to learn band dynamics and the theological foundations of worship. The workshops are mostly run on Saturday mornings at the Methodist School of Music. There are three workshop strands: Vocals, Keyboard, and Electric Guitar. 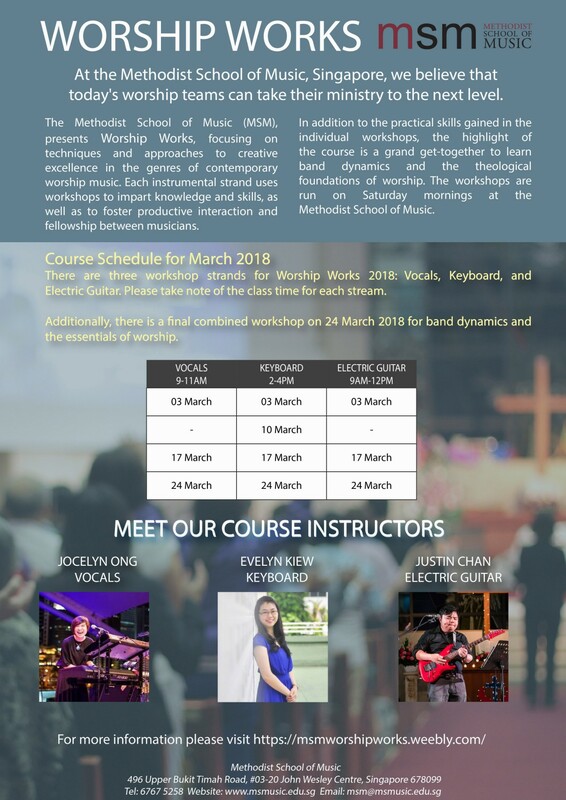 Final combined workshop is on Sat 24 Mar 2018 for band dynamics and the essentials of worship. Sign up now at the relevant links below for the workshop strand of your choice. For more information, please view video visit www.msmusic.edu.sg, email msm@msmusic.edu.sg or call +65 67675258.